It's good to see old friends this Thanksgiving weekend. Sofia, a dear friend of mine was here on Thanksgiving with her 2 kids. She drove all the way from South Carolina with her kids to be with her hubby during Thanksgiving Day. 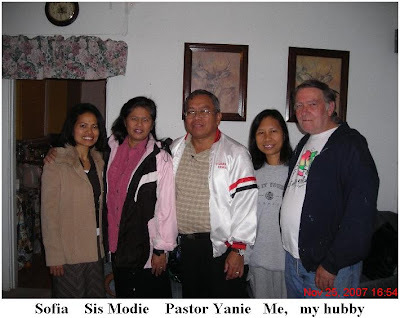 She came to our house with her nephew and niece and she was able to meet our 2 missionary friends from the Philippines who were still in our house last Friday afternoon. I was so glad to see her because I miss her so much. She's a good christian friend of mine and she's like a sister to me. She and her kids will drive back to South Carolina tomorrow. It's gonna be a long trip again for her, almost 24 hours trip. I wish her a safe trip. Meanwhile, our missionary friends left on Friday afternoon after spending 2 nights with us. So it's just me and hubby once again. I miss their company and I wish to see them once again soon.